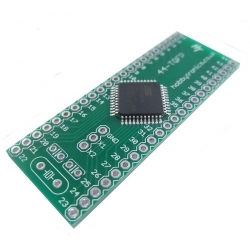 This is the Atmel ATmega32U4 chip used in the Arduino Leonardo boards. 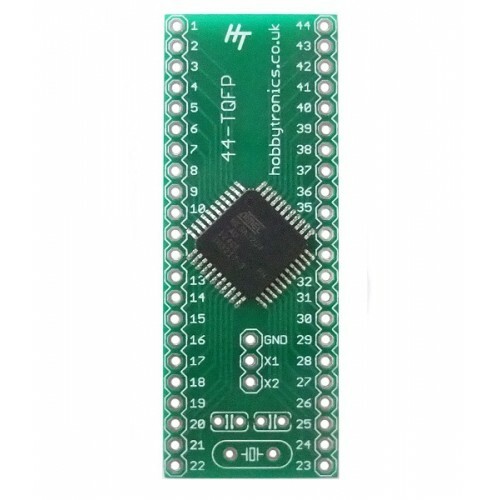 Atmel don't make a DIL version of this chip, so we have soldered it onto one of our 44 pin TQFP to DIL Adapter boards for you so you can experiment with it on a breadboard. We have also installed the Arduino Leonardo bootloader so it's ready to program with the Arduino IDE over a USB connection (see below for wiring link). 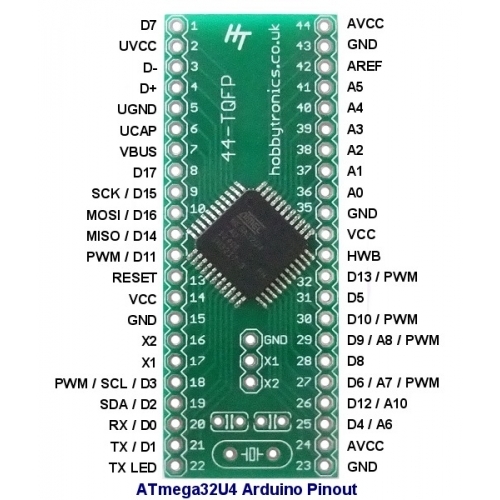 The ATmega32U4 is a low-power CMOS 8-bit microcontroller based on the AVR enhanced RISC architecture. 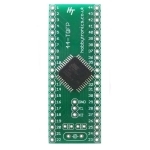 By executing powerful instructions in a single clock cycle, the ATmega32U4 achieves throughputs approaching 1 MIPS per MHz allowing the system designer to optimize power consumption versus processing speed. IEEE std. 1149.1 comp liant JTAG test interface, also used for accessing the On-chip Debug system and programming and six software selectable power saving modes. The Idle mode stops the CPU while allowing the SRAM, Timer/Counters, SPI port, and interrupt system to continue functioning. The Power-down mode saves the register contents but freezes the Oscillator, disabling all other chip functions until the next interrupt or Hardware Reset. The ADC Noise Reduction mode stops the CPU and all I/O modules except ADC, to minimize switching noise during ADC conversions. In Standby mode, the Crystal/Resonator Oscillator is running while the rest of the device is sleeping. This allows very fast start-up combined with low power consumption.